Do you need to provide foreign language support? Reach everyone with your message simultaneously, in any language. The TalkSystem is an affordable voice-silenced communication system that can handle up to 32 languages simultaneously to an unlimited number of listeners. It is completely self-contained and portable. 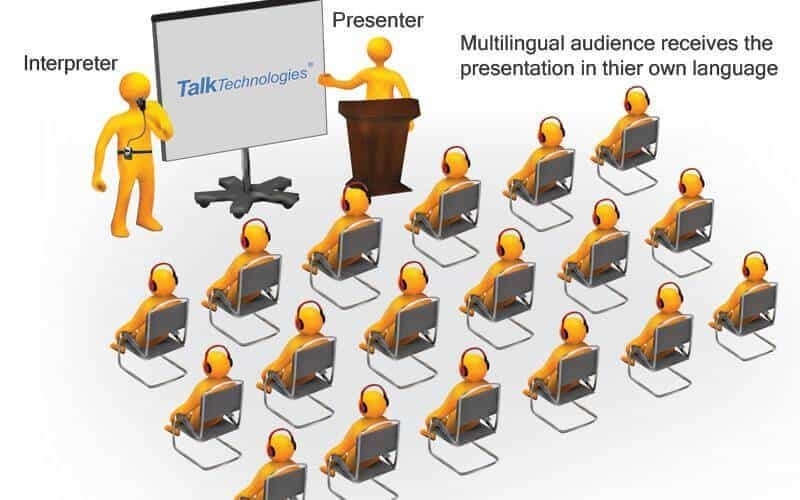 The TalkSystem allows an interpreter to simultaneously translate spoken words without being heard by anyone except the intended listener. This system provides clear, quiet and accurate communication between a speaker and a multilingual audience without distraction, interruption or misunderstanding. The interpreter speaks into a Stenomask, a handheld voice containment unit housing a special microphone. The Stenomask prevents anyone from overhearing the interpreter’s voice. The Stenomask is connected to a small, wireless transmitter which in turn, transmits to a pocket-size receiver with attached earbuds. The listener sets the channel on the receiver to the appropriate language and can then hear a simultaneous translation of the speaker’s words as they are spoken. There is no start-up time or learning curve to consider. This simultaneous language translation system has eliminated the need for a sound-proof booth. All component parts are lightweight, portable and wireless allowing a presentation to take place anywhere and allowing the speaker, listeners and translators to move about freely. Every listener hears your message in their own language as you are speaking! No more confusion or frustration because everyone gets the same information at the same time. Unlike other vendors, we do not provide “boxed”, restricted, or fixed-size systems. With 6 different types of systems available (with different capabilities and uses) it is best to request a proposal to start the discussion on the best system for you. We are happy to make any adjustments and changes to your proposal at any time. Our equipment is used in all 50 States and over 20 Countries by law enforcement, military, first responders, hospitals, schools, corporations, and government agencies. Our transmitters and receivers are backed by a lifetime warranty!